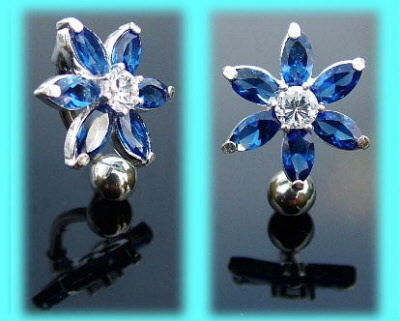 This inverted belly bar has a sterling silver flower design set with clear and sapphire blue stones, which is worn inserted downwards into the piercing, and is available with either a 8mm or 10mm surgical steel shaft. The six petal sterling silver flower, which measures 15mm (approx) has six sapphire blue jewels representing the petals and a clear central stone. The piece is worn by inserting the 316L surgical steel shaft downwards into the navel piercing and is available with either a 8mm, 10mm or 12mm barbell. These inverted belly button bars are also available with clear, pink, rose, light blue, light green, purple, dark green, black and pale lilac gems. The best eCommerce software by ShopFactory powers P9769. All-in one eCommerce and shopping cart software.